Hi Toni (writing as Antonia Marlowe), Welcome to Café Cala. It’s great to have you visit Café Cala. 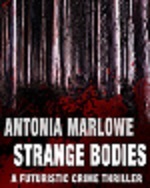 I’ve loved the excerpts I’ve read of Strange Bodies and can’t wait to read the final copy. I’ve been making a special Figaro cake to have with sliced peaches this morning. Would you like tea or coffee with yours? Coffee, please. And the cake sounds superb! 1 Where did you get the idea for Strange Bodies? Mostly from a painting of a Moreton Bay fig, where little crevice and holes seemed to hide lurking nasties. I stood in front of it for a long time and the first ideas for SB came to me. I used that painting for my cover until recently. Unfortunately my publisher didn’t like it. Certainly not money! I’d have to say meeting other writers, both in person and online. It’s a wonderful community, and let’s face it, no one else really understands our particular craziness. I can’t really remember when I wasn’t writing something, lots of very short stories mostly. 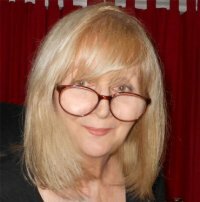 Way back in the 60s and 70s, I wrote a lot of researched articles, mostly for trade and in-house mags, and an occasional short story, mainly sci-fi. Then one day I just started the MS that was to become Strange Bodies. That took six months to write after about a month of research and plotting. I followed that with a romantic thriller, Blue Diamonds. I think joining RWA and entering all their competitions. That really helped me with the technique I needed to write fiction. It also toughened me up to criticism and encouraged me to keep writing. Winning a place in their 5 Day mentorship was icing on the cake (though that was for Blue Diamonds). A follow-up to SB, called Heavenly Bodies. Again, set in a future Australia, a few months after the first book ends. And yes, more nasty murders! Also a collection of my short stories which I plan to self-publish. Read, read, read. Learn the rules of grammar and punctuation. Your writing is never as good as YOU think it is – or as bad. Always carry a notebook and pen – you never know when inspiration will strike. I still love re-reading Agatha Christie. Mostly I read mysteries and thrillers, like those by Lee Child, Sue Grafton, Donna Leon, Ian Rankin, Andrea Camilleri and about six more. I also love Jane Austen, Charles Dickens, and biographies. STRANGE BODIES – a futuristic thriller. Available for Kindle only. Tortured, and brutally murdered, the bodies of the Richardsons hang from a tree deep in the forests of the Blue Mountains, the first of several brutal murders to be unearthed. With local police stymied, former Scotland Yard Commander, Nicholas Adams and his team, are called in. But even with the extensive surveillance of central computer BigSys and the pervasive eyes of cameras that cover so much of the country, it takes the skills of Verity Burne – researcher and freelance writer – to uncover the links between the killings that lead to the discovery of past injustices and a thirst for bloody vengeance. Great post Maggi and Toni. Always love hearing about writer’s journeys to publication. And Strange Bodies is fabulous! Oooh, very intriguing! I love great Australian stories and this looks like it is going to be one of them! Hiya you two! Luv your stories Toni! Congratulations on another giant step with Strange Bodies being published. I know there will be more exciting stories to follow.